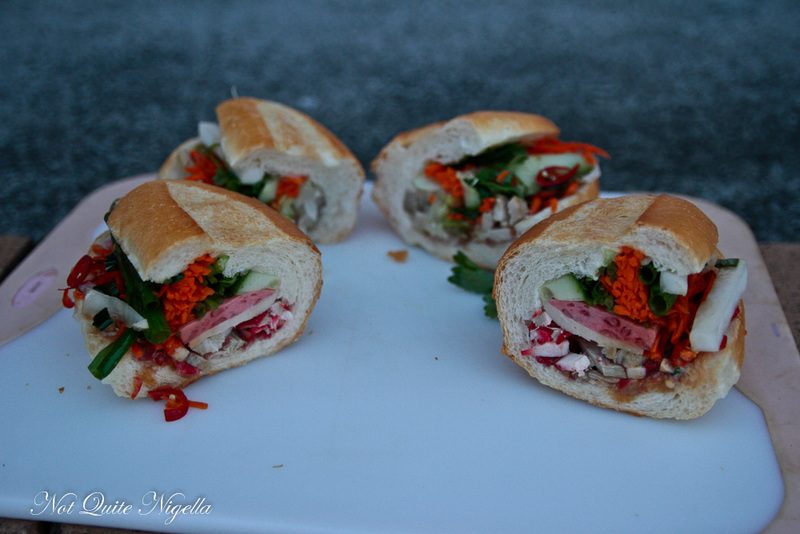 The Amazing Banh Mi Race! At first glance, the crumbs on the chairs and tables may appear to be an act by a defiant and messy eater. Someone that can't eat straight and who would probably talk and eat at the same time. 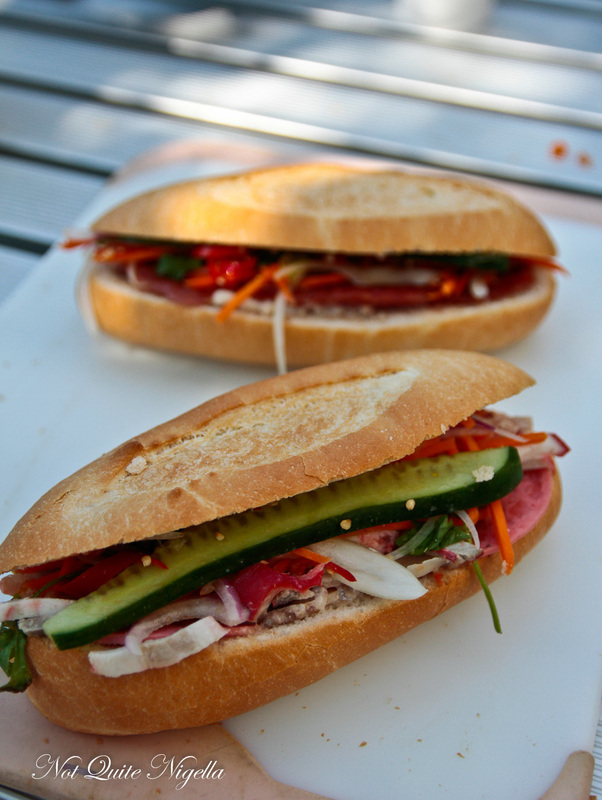 But with banh mi, the crumbs can tell a story. 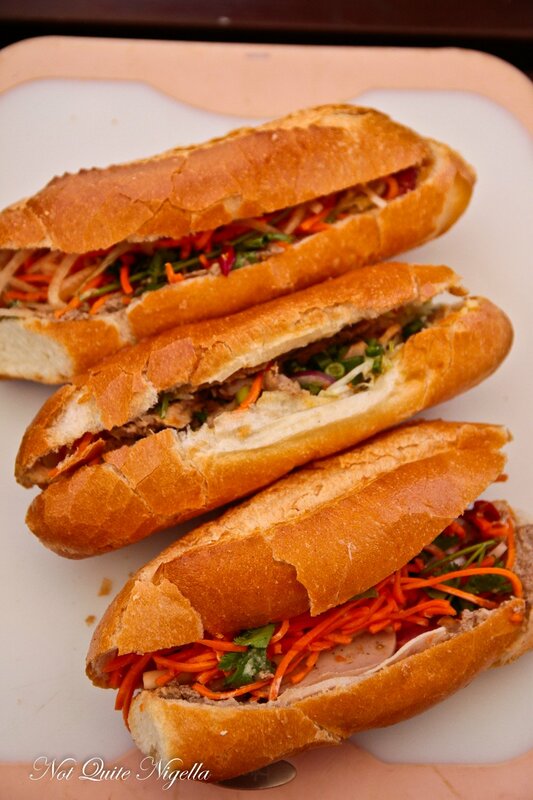 The Banh Mi or Vietnamese baguette roll is the perfect example of how French cuisine melds perfectly with Vietnamese flavours. 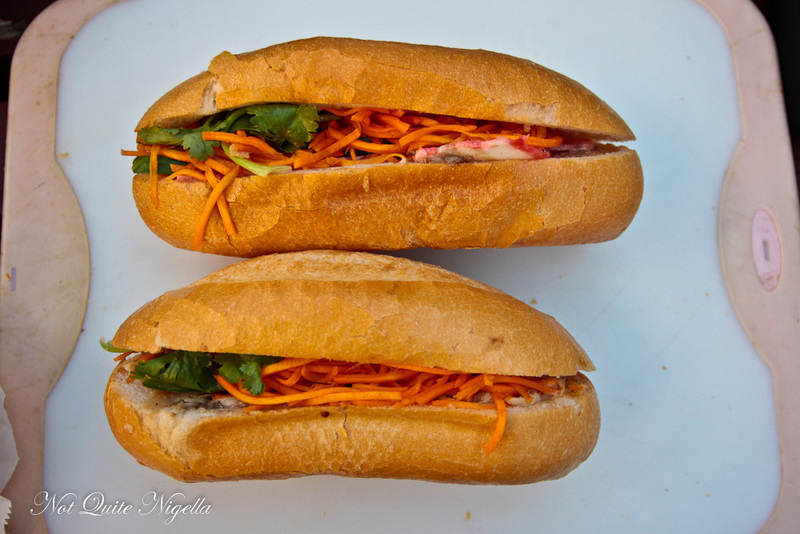 Banh Mi is simply the term for bread in Vietnamese but here Banh Mi seems to also signal the sale of delicious filled sandwiches. The rolls come in a range of flavours but one flavour always features: the classic pork with a crispy white baguette with three types of lunch meat, pate, mayonnaise a mysterious but fantastic liquid brown sauce that delivers pure umami, pickles, salad, coriander, spring onion and chillies. 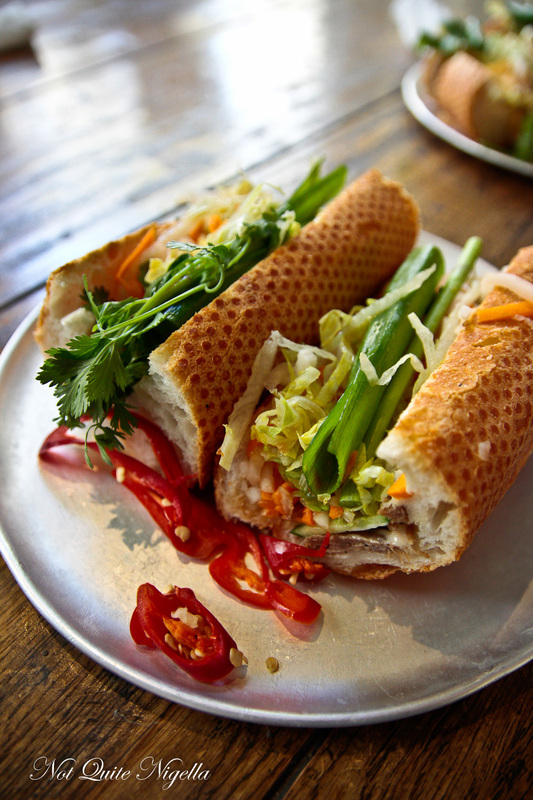 So what makes a good banh mi? 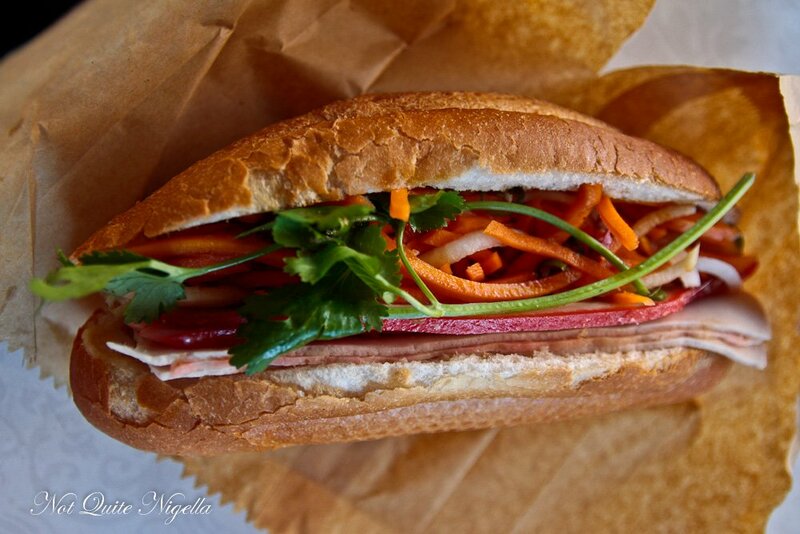 According to Thang Ngo of Noodlies, "The best pork roll is one that can balance the multiple competing flavours and textures. With more than 10 ingredients at play it's easy to get it wrong; too meaty and it's a turn off, too many pickles and it sours your face, if the bread is too soft the whole roll is rendered lifeless. The best rolls allow each ingredient to play their part in harmony - an apt aspiration given this is an east-meets-west delight.The only exception is chilli, you can never get enough, something about that rush and the crimson colour makes me instantly hungry." So one warm day in February, six Banh Mi enthusiasts set out to try and find the best banh mi in Sydney. We decided to focus on traditional banh mi places rather than the pimped up versions that some upscale restaurants are now serving. Everyone has a separate score sheet to complete and to aid in our endeavour, we also brought along some tools. We had paper towels, a chopping board, wet towelettes and a good knife (Louise's Crofton ceramic knife was perfect for slicing up each banh mi into six). It was fortunate that Viggo and Nick actually prefer end pieces with more bread and less filling. We would be trying one classic pork and whatever other flavour was popular at each place. Louise would drive one car and Belinda would drive the other and between Viggo, Nick, Mr NQN and me we would play musical chairs in the car to make things more fun. And in true street style, as a lot of the banh mi stores don't have eat in areas, we would chop these up in the street leaning on our cars or on benches and eat them. Putting together the list was daunting, there are simply so many places that make banh mi but through hours of research, we arrived at a 15 strong hit list of places to visit. As many of the places out west open later than in the city, we'd hit the city ones first which would make parking easier and then head out west later in the day. 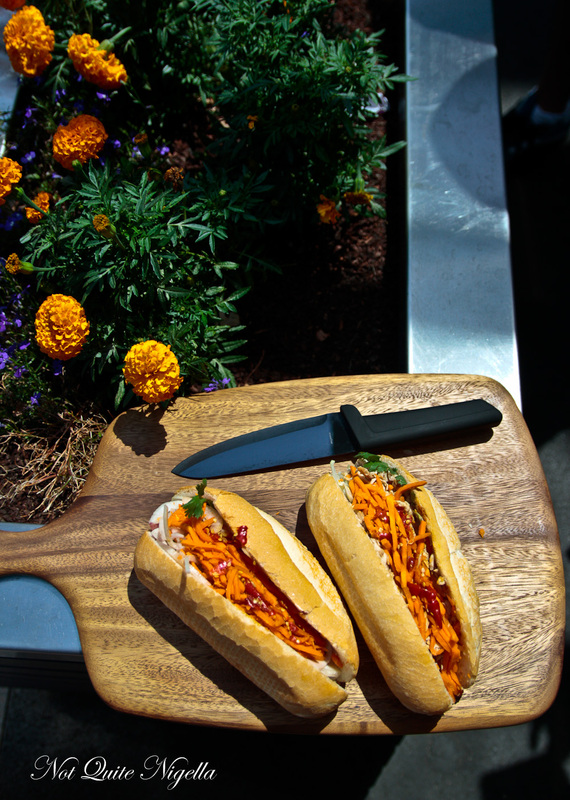 So without further ado, here is our banh mi adventure! And a warning, this is a very, very long post! It wasn't the best start admittedly. You know how you start out with enthusiasm and verve? We certainly did but I was ruing not having called Banh Mi K as google had their hours as starting at 8am whereas it's actually 10am. So just after 9am our assembled throng stands outside the store hoping waiting for the chairs and tables to be moved out and the banh mi to start. Iced coffees are ordered to help pass the time - they're good here but mostly ice. Once our rolls arrive everyone gets excited. We notice that the rolls are warm - being so early in the morning they're freshly baked and we note that we need to cut some places a bit more slack the later in the day. We have chosen a pork roll and the lemongrass chicken roll. Nick places a hand on the bun and says "That's firm, like a 22 year old" to much derisive snorting and eye rolling. The pork roll is good with what Louise notes to have a "nice chilli hit" while all of us are smitten by the lemongrass chicken roll with plenty of still warm aromatic lemongrass chicken on top. 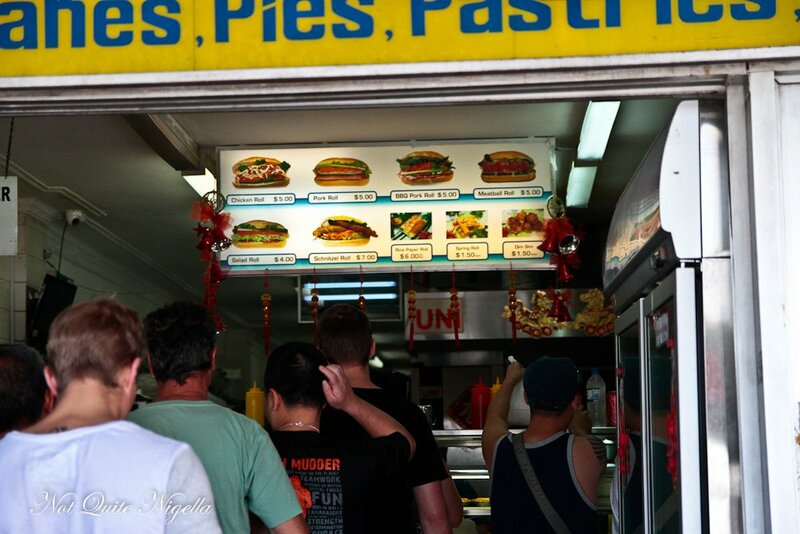 "The lemongrass chicken is awesome" Nick says on his notes and Louise marks the bun and chicken filling 9.5. We look at the time and realise that we're running behind schedule so we high tail it to our next destination leaving behind a trail of carrot shreds and crumbs. This will be the theme of today: crumbs and gluttony. Finding two parks near each other on Belmore Street is serendipitous and the parking gods have been merciful thus far. Taste Baguette are said to have fresh baguettes every 15 minutes. The chicken filling isn't quite ready so we order a classic pork and a tofu baguette and take a seat in the pretty looking cafe. The banh mi come out and they're cut from larger baguettes and are smaller than the other places and pricier although we expect that with the surrounds. The chillies are larger red chillies served on the side. The tofu one is better than I imagined it to be, there is plenty of flavour there but both have a very sweet pickle added to it. Louise notes "Needs a kick, too sweet" while Nick liked the dressing but the baguettes aren't warm and these don't score particularly highly, especially since Banh Mi K had produced such stellar versions of banh mi just beforehand. 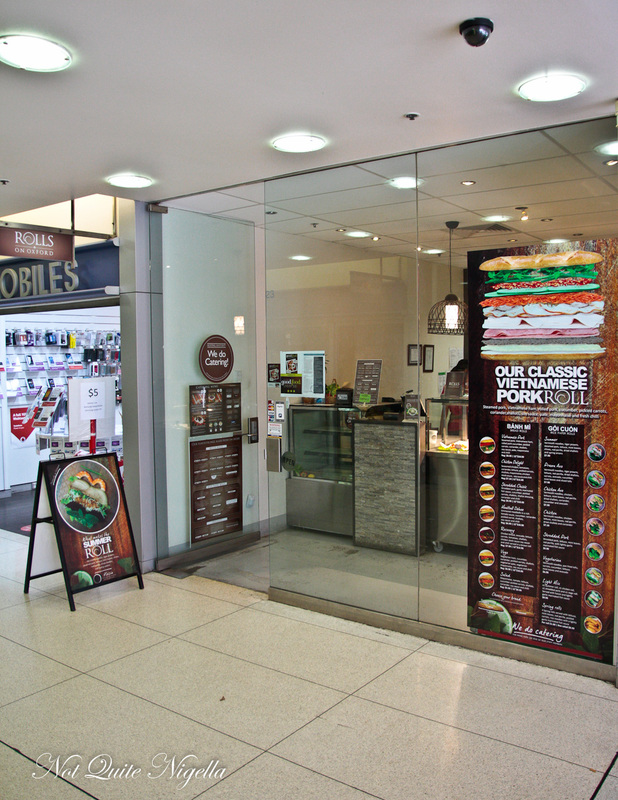 We make our way to our next destination Rolls on Oxford located in Oxford Square on Oxford Street, Darlinghurst. Here they make banh mi as well as rice paper rolls and the small store is just at the entrance. 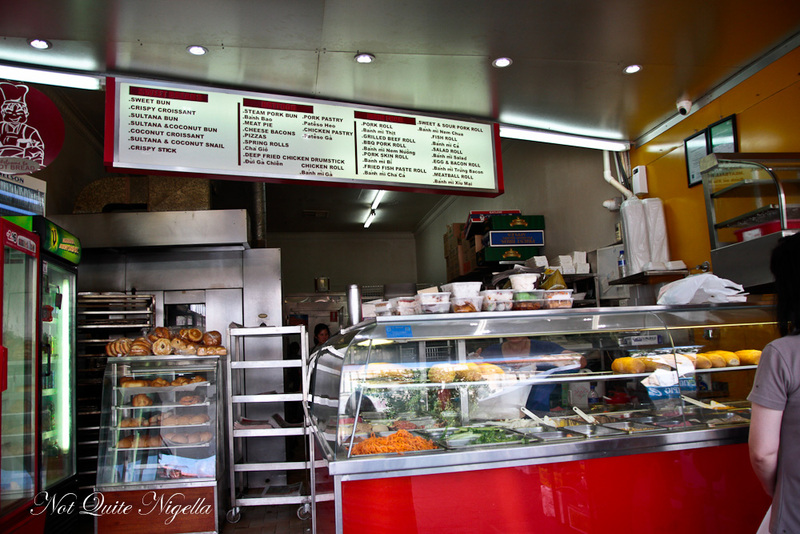 They're very friendly and we order a pork and a chicken roll which they make up quickly to order. Prices are a bit higher here. This place would prove our first "street food" challenge as there is nowhere to cut up or sit down to eat the banh mi. 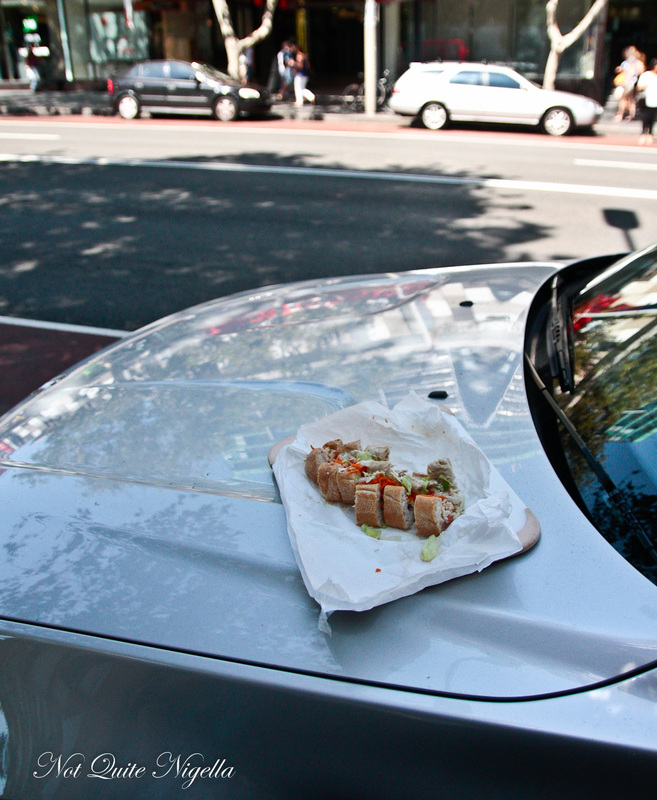 So there we are, on busy Oxford Street, resting our chopping board on top of Louise's car hood slicing away the banh mi and eating our portion. The buns on both of these rolls are quite soft and not as fresh and warm as at Banh Mi K but the fillings are really good with plenty of sauce and chilli and a good balance of flavours although the actual chicken isn't as much a hit. It tastes like regular poached chicken but is supposed to be seasoned chicken. Mr NQN doesn't like the pate on the pork roll while Louise finds these a bit bland but it depends on whether you get a hit of chilli and Viggo and I find ourselves huffing over it. "My lips are on fire" I say before adding "In a good way!" and we pack up and ignore anyone giving us curious look as we head towards the big daddy of banh mi, Hong Ha in Mascot. 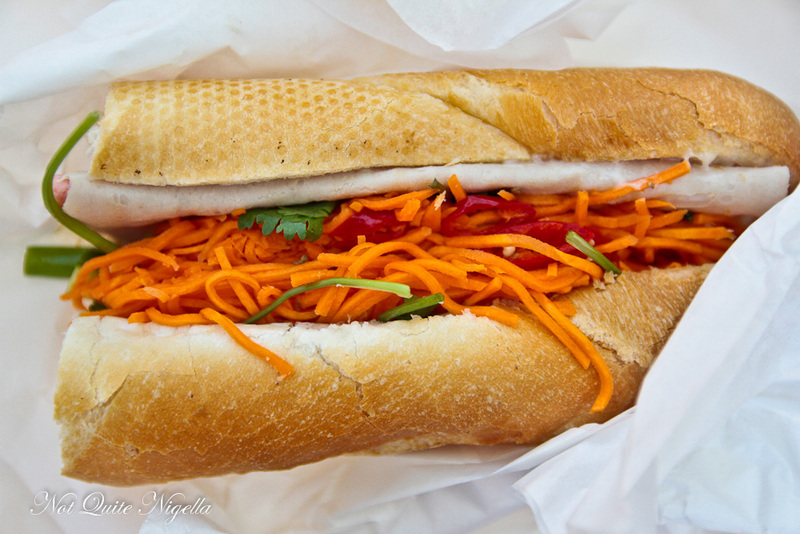 About 70% of recommendations for banh mi point straight towards Hong Ha in Mascot. It is a place so successful that it has spawned the Red Roll franchise. You can tell Hong Ha's location by the ever present queue. Fortunately the queue moves quickly and I overhear a woman on the phone to a friend giving her a status update on the queue. And this is as close to a banh mi nazi as you can get as I watch the woman next to me almost not get her banh mi. "What do you want?" the woman asks her. The customer asks her son whether he would like onion, then she asks him if he would like carrots and then she asks him if he would like pork. The woman (one of five) behind the counter rolls her eyes and leaves, her body language and expression clearing reading "If you haven't got this sorted already while you were waiting, don't waste my time." Things get a bit heated between her and the customer who huffs that the woman wasn't listening to her so she can't get her banh mi order right and I just take my banh mi and get out of there grateful to have it in my hands. Resting the chopping board on a flower tray in the street we slice up the pork and chicken rolls. Hong Ha is actually known for their chicken rolls over their pork. The buns are fresh, light and crunchy while the fillings score high. Viggo remembers back to 10 years ago when he worked in the area and they were $2.80 each. "It tastes exactly the same as it did back then" and that's what Hong Ha offers, consistency of a great product. By now the sun is sapping strength and as we're out west, it is several degrees hotter. Louise, Viggo and Mr NQN have found a park but Belinda, Nick and I are circling. 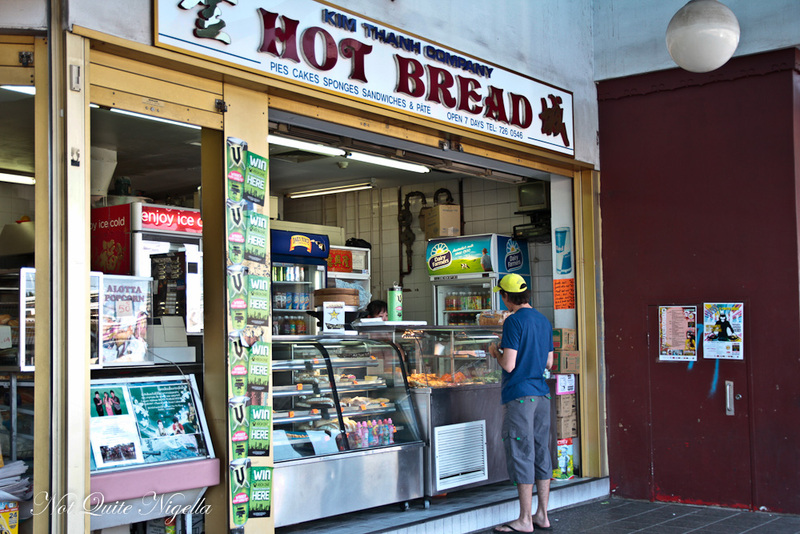 A space frees up and by then Viggo is already in line for a banh mi at Kings Bakery on Forest Road. He comes back impressed by the fast, clean workings of the staff. We take a seat on a bench and slice up our rolls while people in the restaurant nearby regard us with curiosity. The rolls are crusty and there's plenty of filling in these which I like. I also like that we get a good hit of sauce and mayo in mine which admittedly makes them hard to eat as they can drip and of course we spill a little on our clothes which is quickly wiped up with the towelettes. I don't want to scare anyone but I notice that my belt which admittedly I had pulled quite tight is starting to feel very tight and we are not even half way through the list! 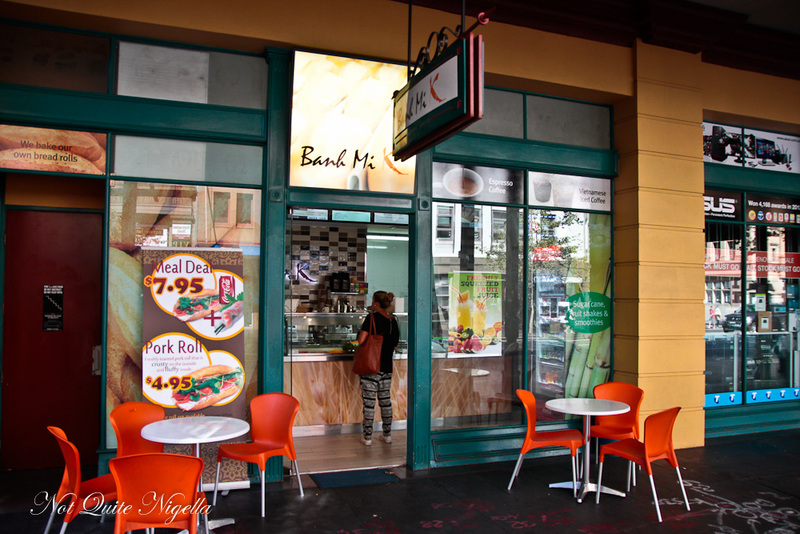 Who in their right mind opens up a Vietnamese roll place next to Marrickville Pork Roll? At Delish the range of banh mi is extensive and features six types of pig: pork, bbq pork, honey bbq pork, julienned pork, ham and fermented mince & julienned pork. In a previous visit Belinda and I fell in love with their honey bbq pork roll so we add another into the order over our usual two. "I don't feel well" Mr NQN says and says that his head "feels funny". He sits on a bench for a time out refusing to eat any more. I must admit that I was especially waiting for Delish because it was hot and all I wanted all day was one of their coconut smash drinks. Today it is sweeter than I've had it before but the coconut and lychee is the best thirst quenchers around. We remove them from their white paper bags. The rolls are gorgeously crispy and crunchy. We try all three and Nick and I like the bbq pork while Belinda still loves the honey pork giving the meat score her first "10". Louise wants more mayonnaise on hers while Viggo isn't as smitten with these. Another favourite banh mi place is literally a hole in the wall. 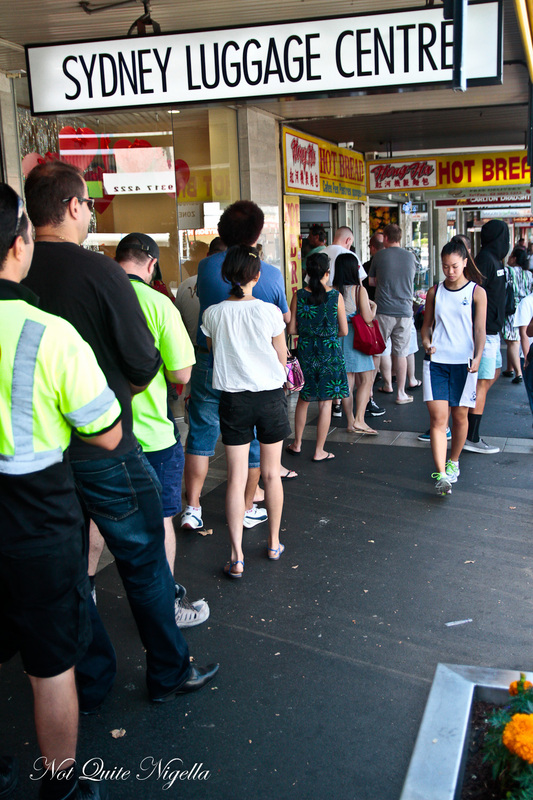 Formerly the toilet at the pub next door, Marrickville pork roll's queues could at times rival Hong Ha's. 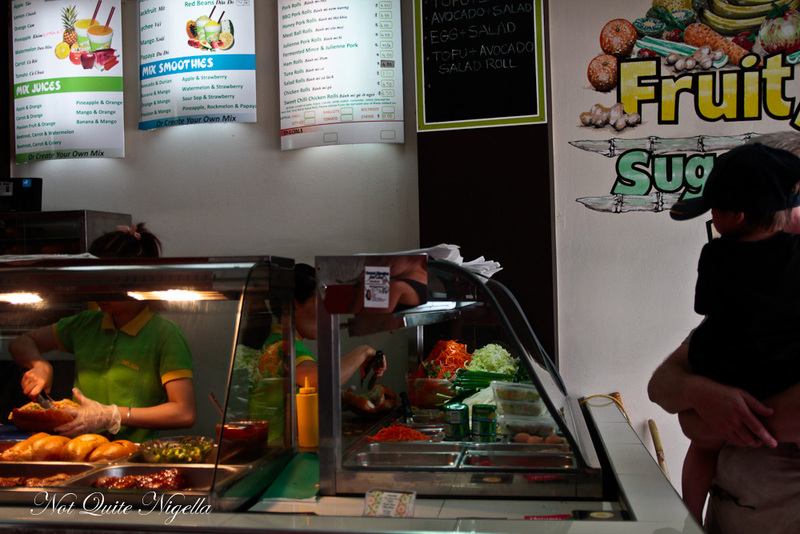 Here one person takes your order and money while the three women behind the glass work quickly and before you know it, you're holding your banh mi in a bag. There's nowhere to eat these so we make our way to the forum area nearby and slice them up. 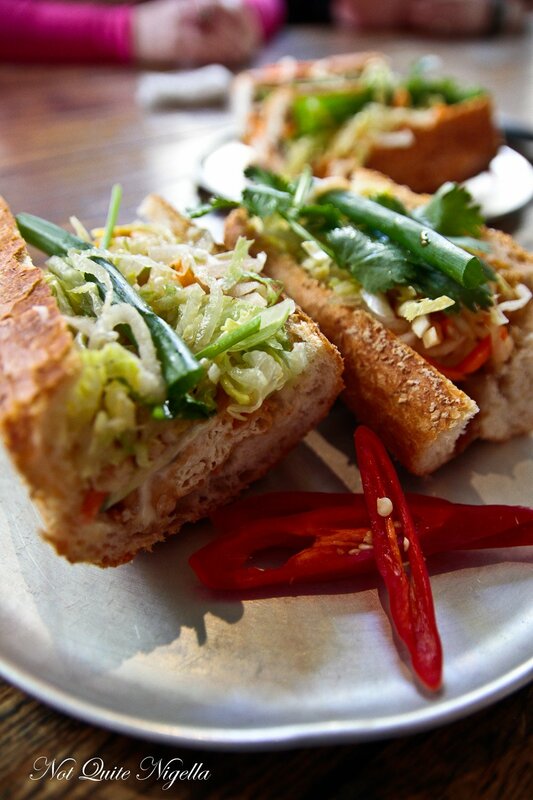 They're greeted with much enthusiasm which shows that even the smallest place can churn out fantastic banh mi. There are lots of 8's and 9's here and while I have always thought that their buns could be crisper, the fillings are fantastic and I give both 9. 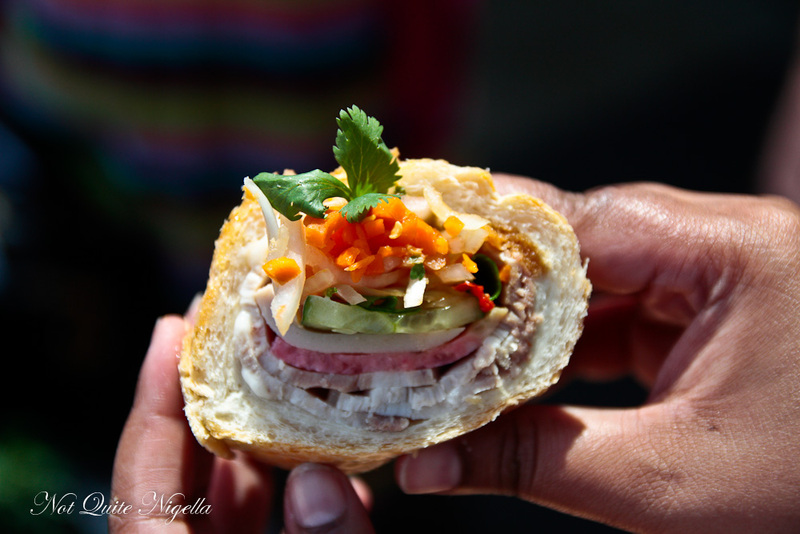 Marrickville Pork Roll also happens to be Thang Ngo's favourite place as well. We're heading west again and this time, it's to Bankstown. There are two sides to Bankstown - an Asian side and a Lebanese side and because Belinda works in the area, we arrive on the Asian side straight away and manage to score a great park. As serendipity would have it, the two shops are within about 50 metres of each other so we start with the one on the right while the others arrive. The prices for banh mi are astoundingly good and they're friendly here too. 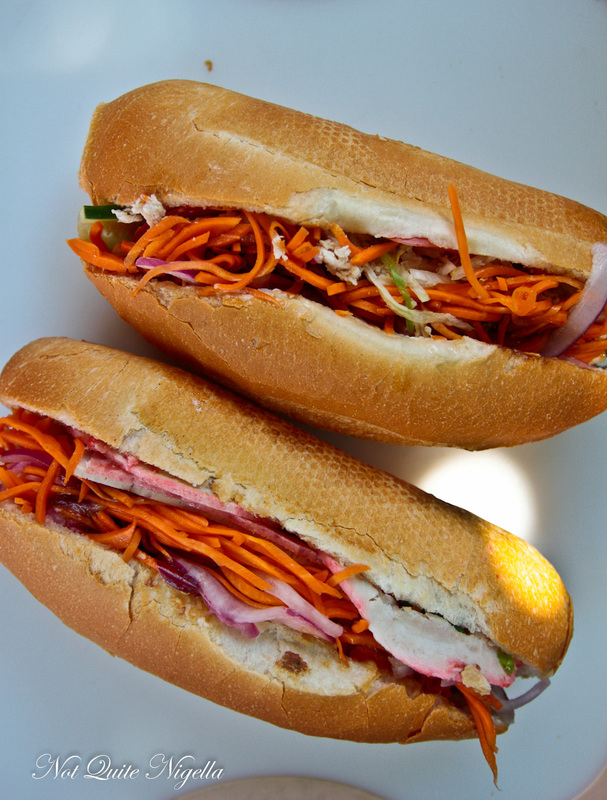 Two banh mi and two drinks sets us back a mere $10! I've already admitted that I do love a saucy banh mi and Nick sets about cutting up the banh mi while Belinda and I go to Bay Ngo to buy the other two. He tells us the banh mi here were very saucy which may explain why I liked these so much. We purchased a pork and bbq pork with pork skin roll here and we all liked the bbq pork which is a flat, sweet basted sausage patty. Viggo doesn't like the pork skin finding the texture jarring and calls them "worms" scoring it a 4 while Belinda scores the filling 10. Conveniently, there are plenty of outdoor tables in the shade and we watch a large group of men playing cards while we eat our banh mi. A few doors down at Bay Ngo, I was sorely tempted by the glistening array of Vietnamese sweets on offer but I had to stand firm and just order banh mi. We ask about popular flavours and the woman tells us that the bbq pork is a firm favourite. "Darling, try this" she says smiling and offering us tastes of the bbq pork. 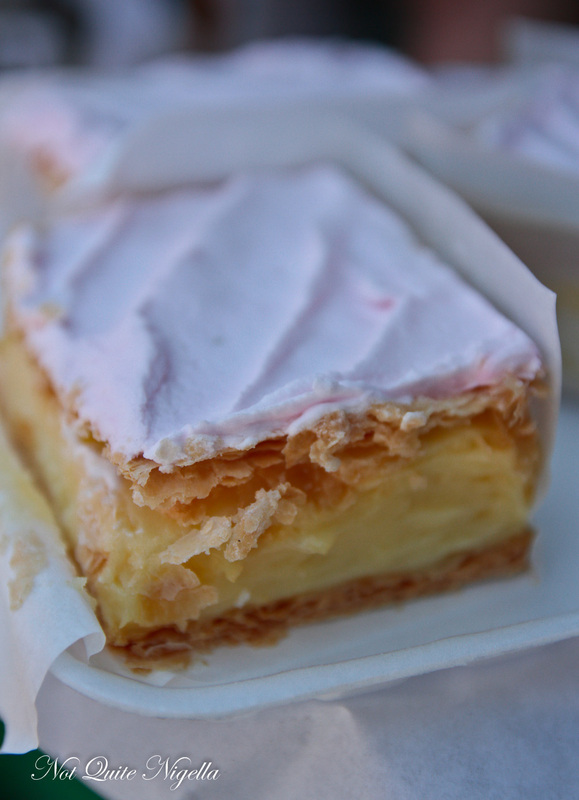 It's sweet and juicy and we choose one of these and a regular pork roll. The rolls are good and some prefer these to Nam Fong while others don't. Louise comments "Holy hell chilli" while Viggo writes "TOO MUCH CHILLI" with hers while I prefer a bit more dressing to mine as does Nick. "Bankstown represents!" Nick thunders as if he grew up in Bankstown (he didn't) and we leave the overfed pigeons who billow at our heels eating the crumbs. 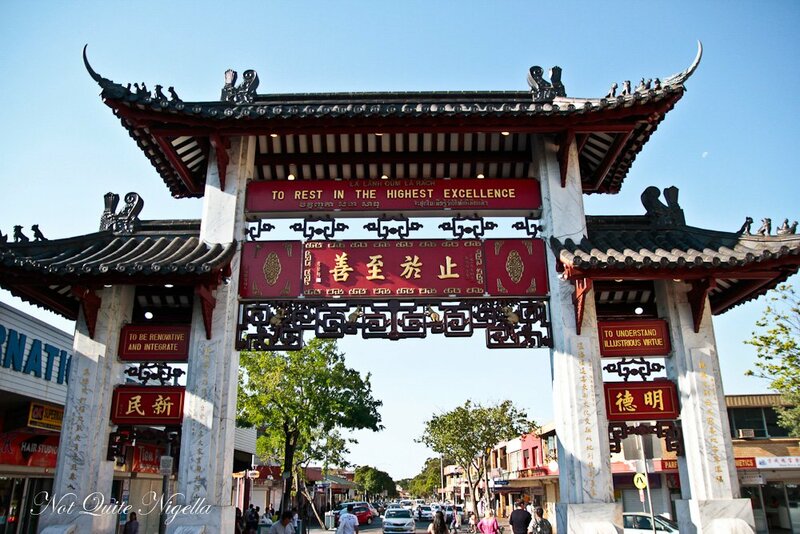 We're headed to the home stretch and our second last destination is Cabramatta. We park in the main car-park and walk towards Kim Thanh Company just opposite the train station where Mr NQN is buying our pork rolls. He rejoins us in the eating efforts but refuses to eat the bread. "I have a gluten intolerance" he says plaintively. They're friendly here and seem quite amused by our antics. 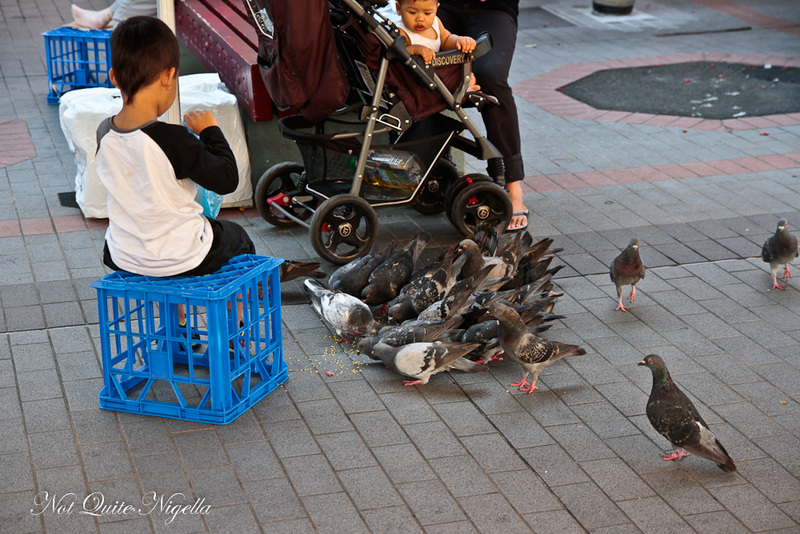 We sit down in the nearby mall area where children are busy feeding pigeons and our ritual attracts the odd look but nothing more. It's late in the day so the rolls at all of the places are less crisp than they were in the morning but the fillings aren't bad. We buy a pork and meatball roll here while Viggo finds that the meatball roll "tastes like fridge." By now a lot of them are fading into each other and I've stopped writing tasting notes. Too hot to do much else, I buy a mango smoothie and Viggo offers to buy the next two banh mi and takes Mr NQN along. However my impish husband steals my smoothie from under me. The word is that at Viet Hoa, you can even find the shop open past midnight. 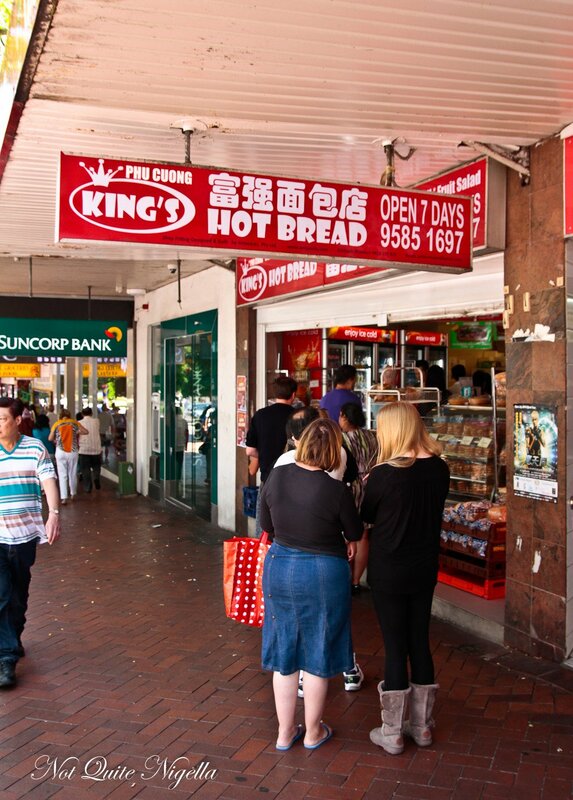 The opening hours for these shops are long, starting at 4:30am and finishing at 6pm in Cabramatta. 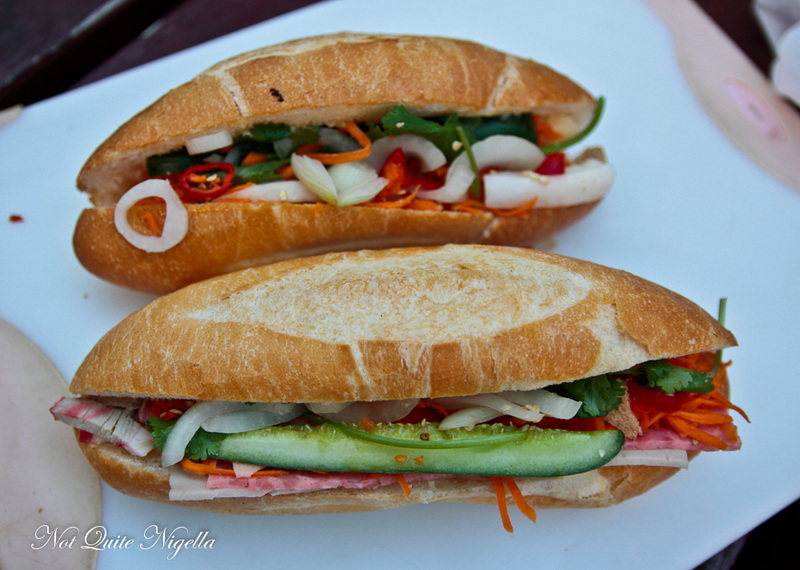 The banh mi at Viet Hoa are quite similar to Kim Thanh company in terms of ratings and taste. In fact recalling them I can't actually point out many differences. The only difference was that I found the chicken very dry as did a few of us. However they are both cheaper than at Kim Thanh and $3 is the cheapest pork roll we have come across today. Little did we know in our confusion that we had walked straight past Vinata which is around the corner from Kim Thanh so we back tracked and bought our banh mi here. There is plenty of signage here including "Food bloggers favourite" and I have to say that the presentation here is exemplary with everything neatly arranged and the neatest mound of pate I've seen. Taking these around the corner we decide not to cut these up in the shopping centre - perhaps it isn't the wisest idea wielding a knife around the nearby security guard even if it was just to cut up a banh mi. The pork roll here is quite different from the rest with thickly cut pork luncheon meat which none of us really went for. However Nick and I liked the chicken one but Louise liked the sauce on the pork roll. We look at the time and it's nearing 6pm and our last two places close soon. It's not far away so we make the drive to Canley Heights. 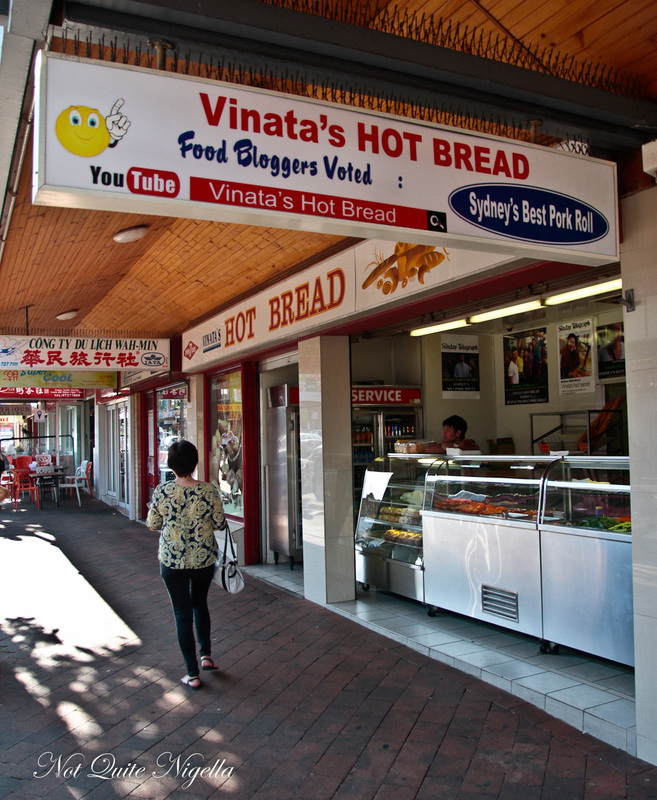 We get a text from Mr NQN who is in Louise's car and he tells us that Tina's Hot Bread is closed. 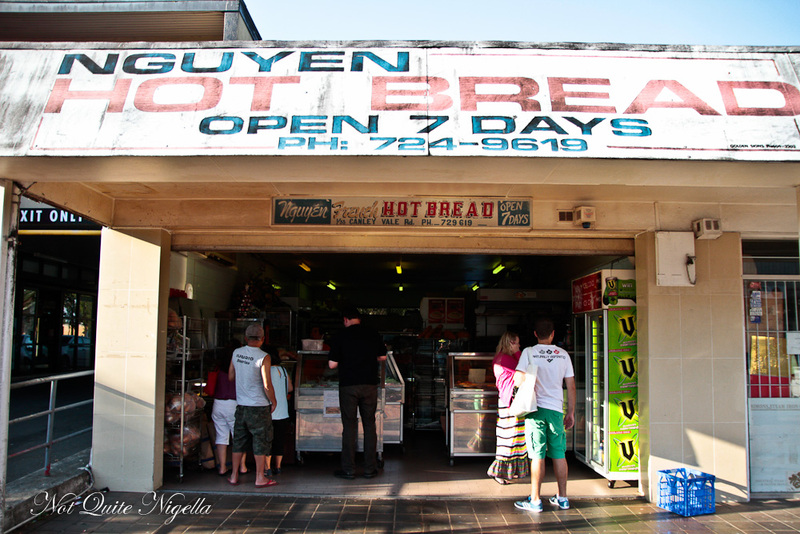 Employing some crack driving moves, Louise deposits Viggo and Mr NQN outside of Nguyen Hot Bread and goes to park the car while the boys order. They're closing soon but there are still people lining up to buy banh mi and there is only pork available. 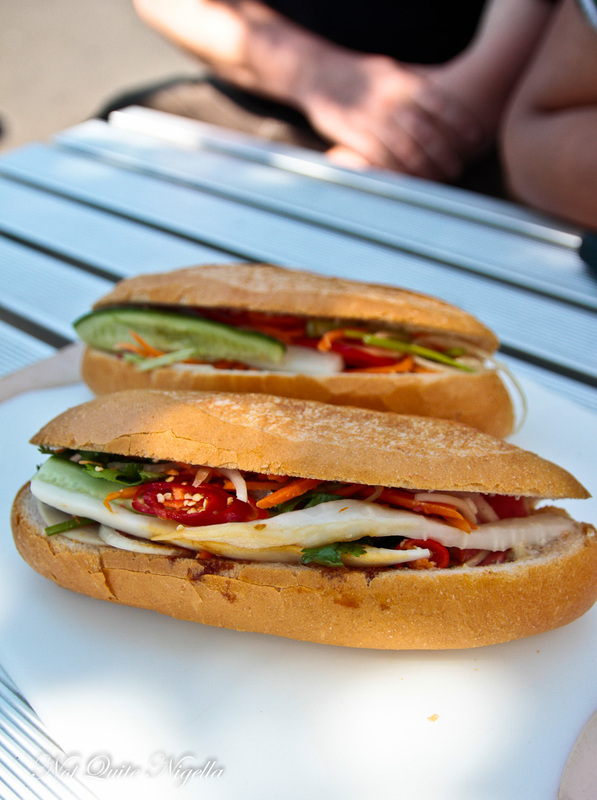 We sit down on a park bench on Canley Vale Rd and regard our last banh mi. Nick hands me the knife. "I think you should do this one" he says. Even though we've had almost 30 banh mi by now, this one does taste quite different. The pate on this is strong which divides people. I don't mind the strong pate which reminds me of dark chicken meat but Belinda and Nick are less smitten by it. We brush off the crumbs, pull out our last towelette and make our way back to the city to the area half a day ago, we started this whole adventure. 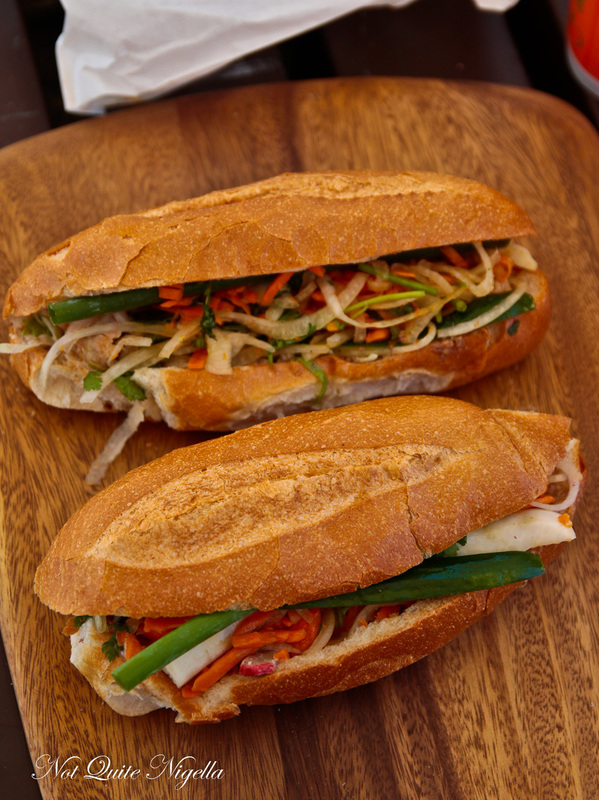 So tell me Dear Reader, where is your favourite banh mi? Which one do you usually order? 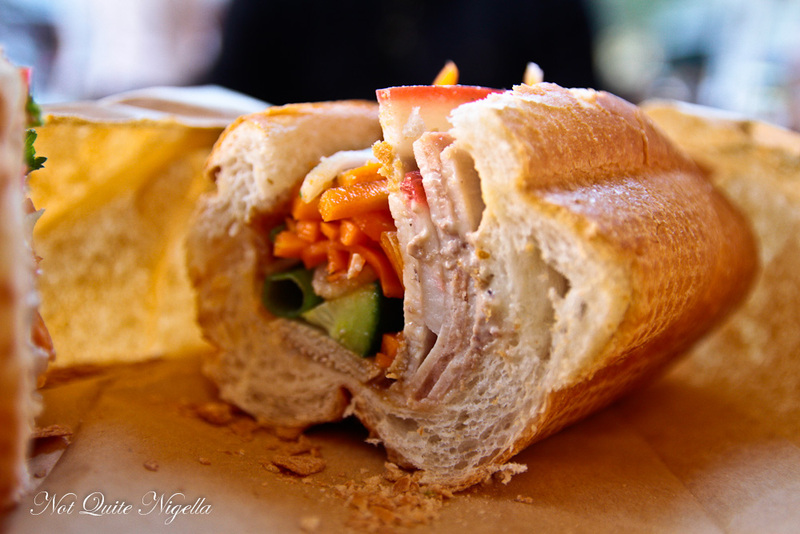 "This banh mi crawl was a great way to satisfy a craving. Highlights: carving up these tasty delights on the footpath and eating them in true street style. Never mind the stares from confused passersby. Lowlights: none really but didn't love the pungent pate of the Canley Vale store. My heart belongs to the honey pork roll at Delish enjoyed with the coconut crush drink- yum!" 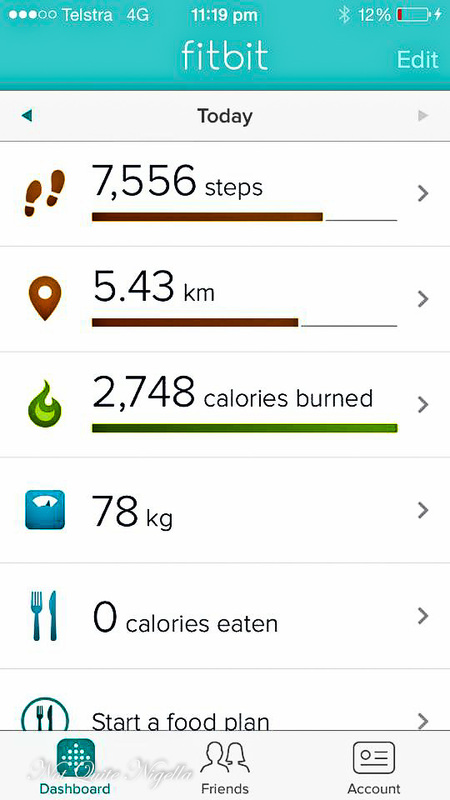 "Highlights: The whole day was fun and everyone was in great spirits. And it's always nice to end the day in a restaurant and reflect on everything and debrief. And a cool shower at the end of the day felt wonderful. Lowlights: The heat. And Mr NQN running off with my smoothie. Never trust an Elliott with your food. Surprises: that everyone liked the same places. 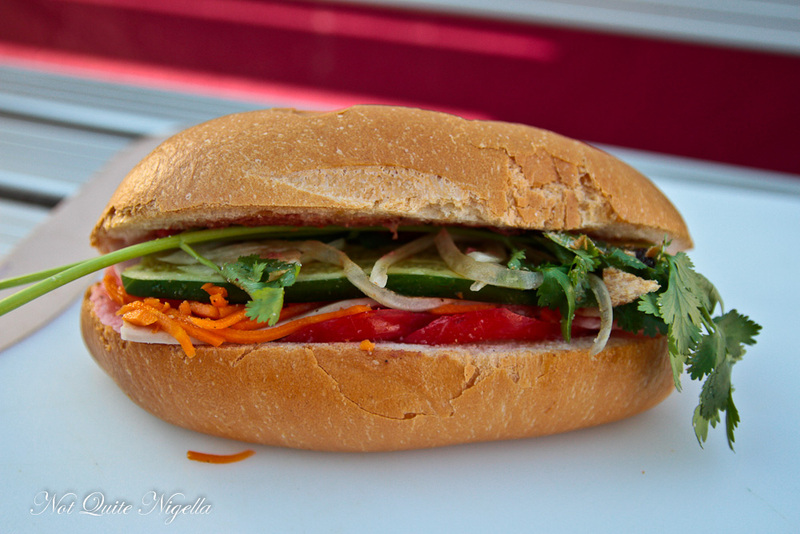 There were also clear favourites within each area so no matter where you live, you can find great banh mi. After crashing to sleep when we got home just before midnight, I woke up at 3am unable to sleep as did Mr NQN. Writing the story the next day, I started to get a craving for banh mi all over again but I settled with a salad instead." "Highlights: My highlights were finding some really good BM in Sydney with clean and fresh flavours. With the top three being 1. CBD 2. 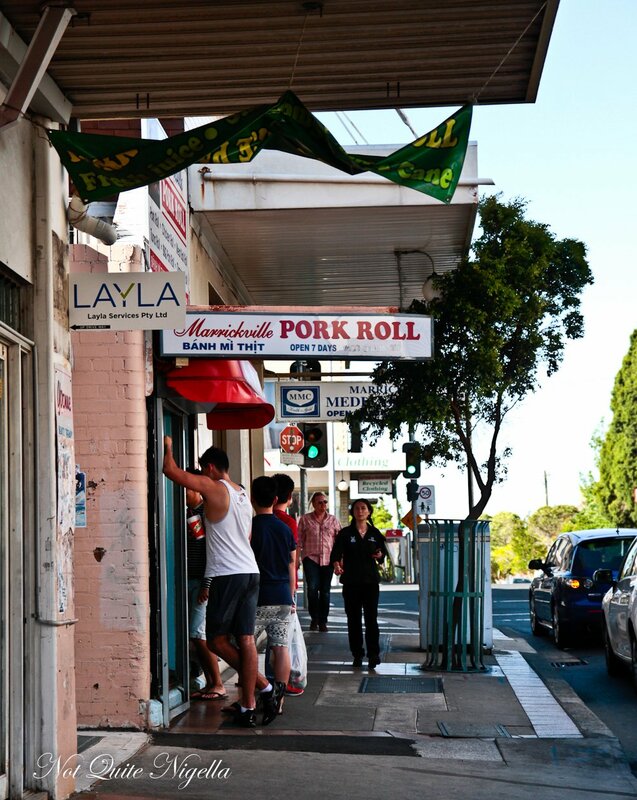 Hole in the wall Marrickville Pork roll and 3. Mascot Hong Ha. Lowlights: Some banh mi flavours were muddy and indistinct with the ratio of bread to filling too low and some of the bread was dry and unappealing. I'm not that big a fan of Mayo in banh mi’s. 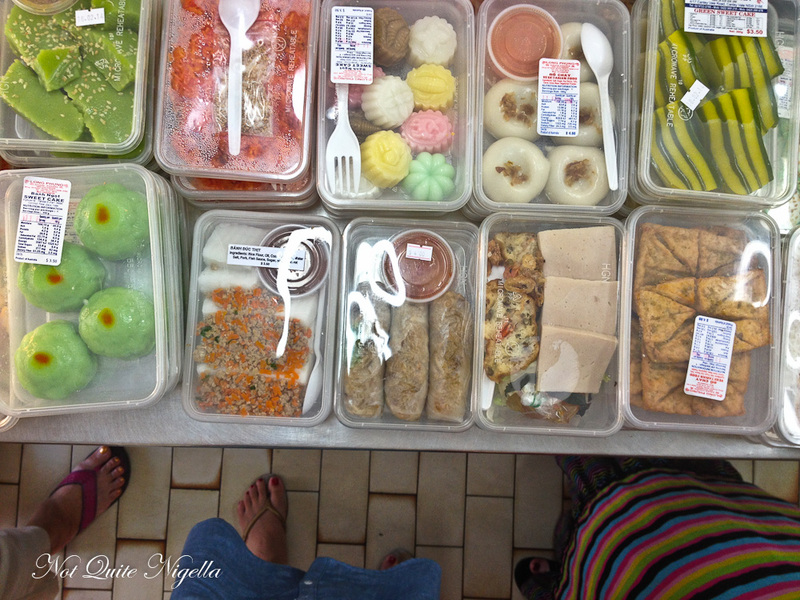 Surprises: The prices of banh mis. Some were in the under $5 mark, they must go through so many to make it worth the wages, rent and products. Also that there is such a large banh mi following resulting in some places having a 15 minute wait for them, not that it mattered as these were the ones with the good flavours." 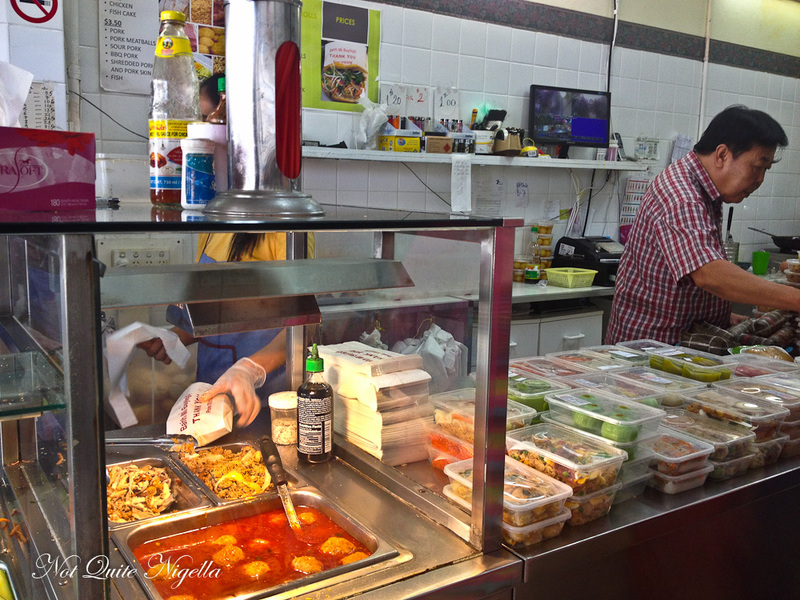 "Highlight: Aside from previously visiting some restaurants I haven't really explored Cabramatta much. Really enjoyed wandering around looking for the shops. Felt very much like being somewhere in Asia. Lowlight: Feeling unwell and not being able to go anywhere near the distance. 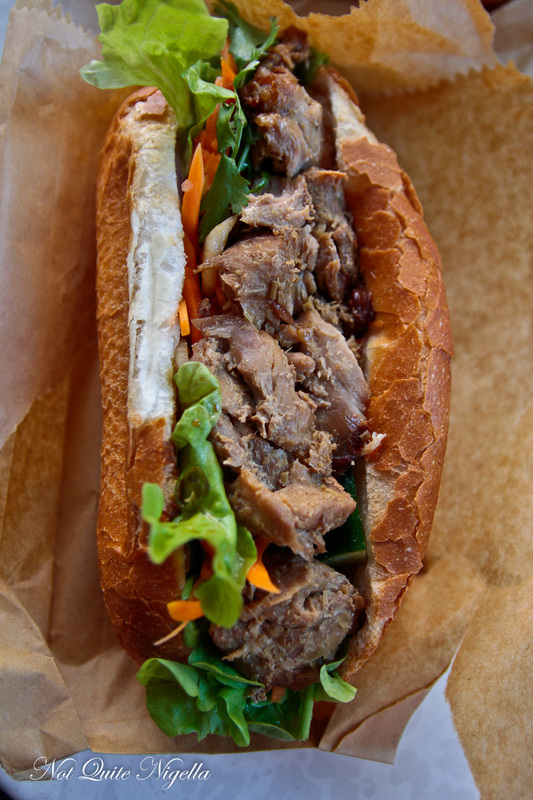 Surprise: That there was a CBD banh mi shop which was very good." "Highlights: conversations in the car! Relationship advice from my two "sisters" (Belinda and Lorraine). Lowlights: everything went so smooth, apart from waiting at the first joint! 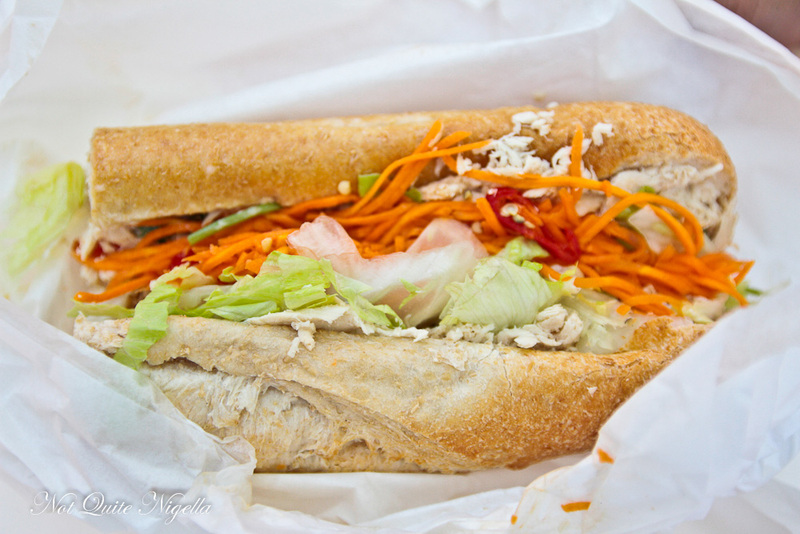 Surprise: the banh mi lemongrass chicken at Haymarket, not sure how legit a banh mi it is. Lorraine's loves Frappes!! Was trying to find a larjee one. Taste knows how to make bread, but if you want flavour, you need to hit cultural melting pots eg: Marrickville, Bankstown, Canley Vale. My knife skills are amazing with quality equipment. Glad my hood of Marrickville represented well. Never skimp on quality. Wet Ones original are the best, and needed on these projects. Actually Hurstville was a surprise, due to the strong Chinese community there. 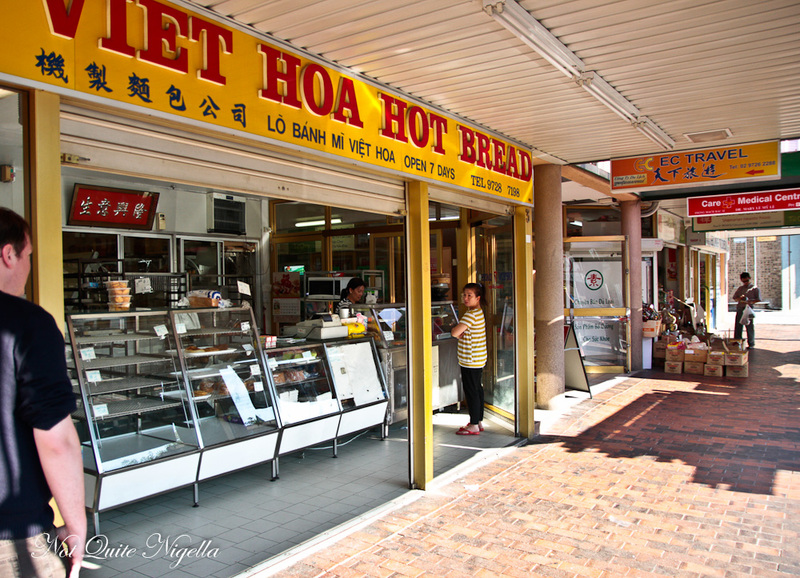 Bankstown has a strong Vietnamese community, they should do well, but you never hear much about their banh mi. Highlight: our review dinner, always finish with a bang! 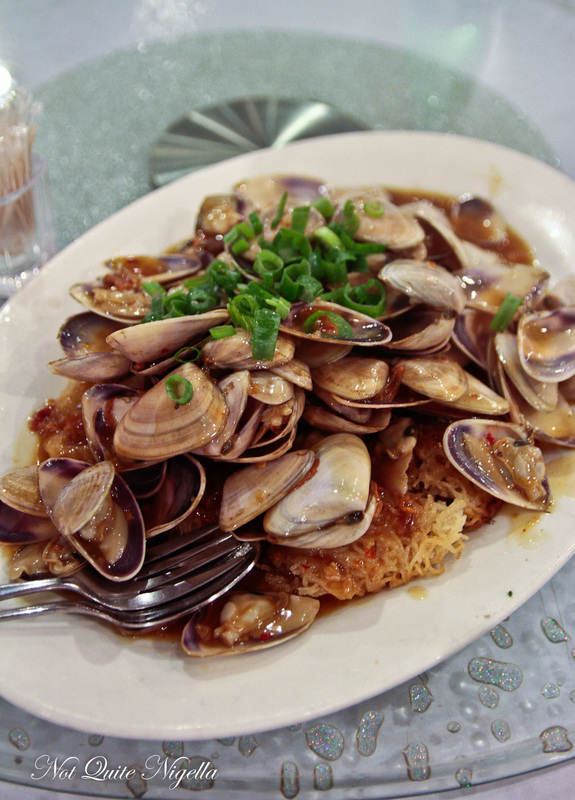 Pippies XO with fried noodles are part of my top 7 in heaven!" 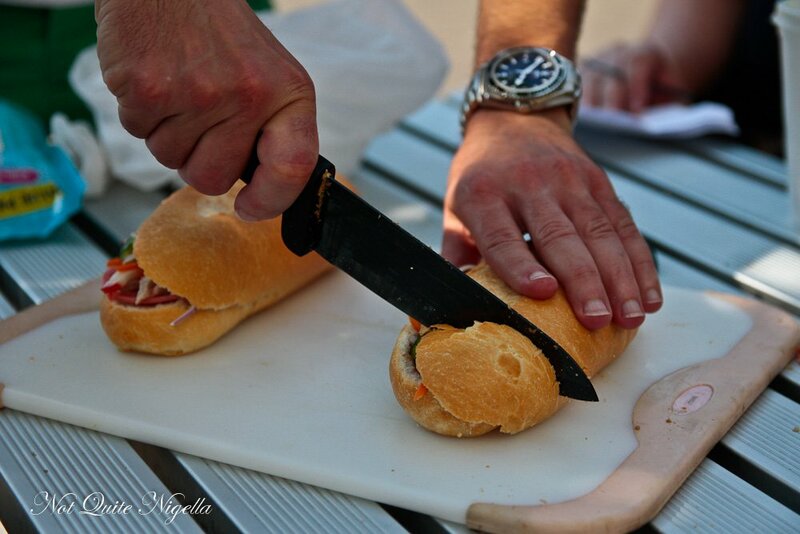 "Highlight: watching how quickly the bakers at Kings bakery could out together a delicious bahn mi, quite impressive. Lowlight: waiting in line - they should get beattheq or a similar way to order. 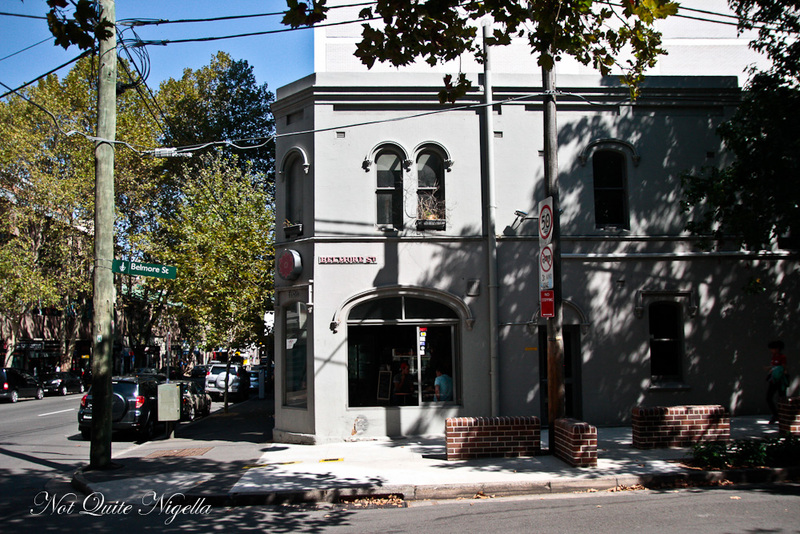 Surprise: Marrickville hole-in-the-wall bahn mi was surprisingly good, its hard to know what to expect by how the premises looks alone." 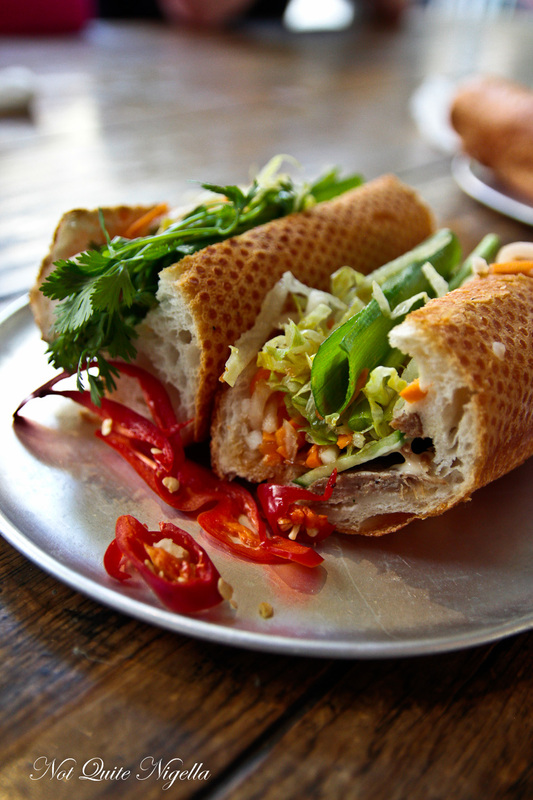 Do Your Own Banh Mi Run! I've put locations in the order in which we visited them. The hours are the opening hours on a Saturday. Call to get hours for a specific day. All food in this post was independently paid for.